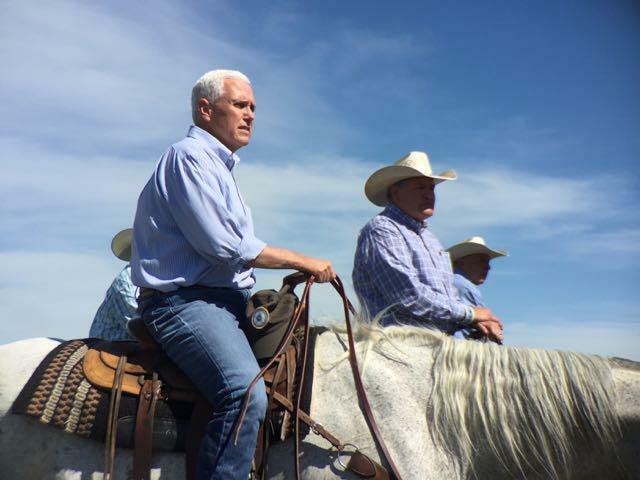 (Left to right) Interior Secretary Ryan Zinke, Vice President Mike Pence, and Senator Steve Daines pose for a photo. 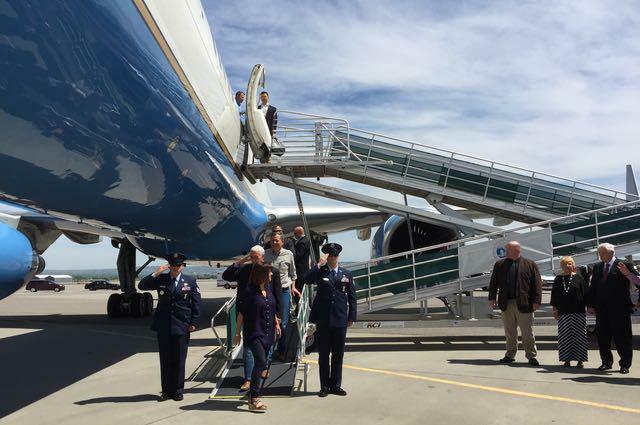 Vice President Mike Pence salutes as he leaves Air Force Two at the Billings airport. He's followed by U.S. Senator Steve Daines. Vice President Mike Pence is greeted by U.S. Interior Secretary and former Montana Congressman Ryan Zinke. 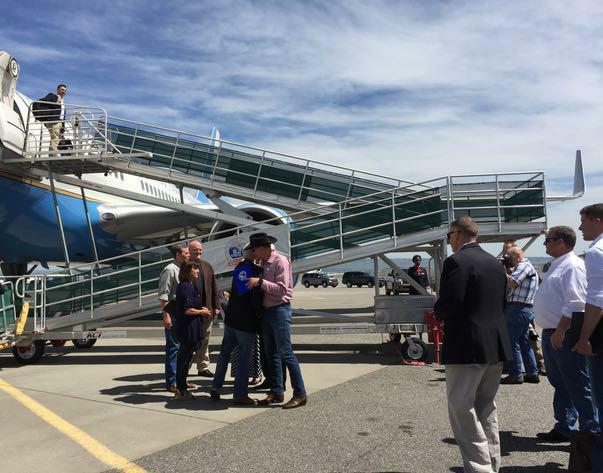 Zinke met Pence at the airport after flying in from a visit to Bears Ear National Monument. Vice President Mike Pence is flanked by Westmoreland CEO Kevin Paprzycki, L, and Interior Secretary Ryan Zinke, R, and Crow Tribal officials on a short tour of the Absaloka Mine. Westmoreland Resources leases coal from the Crow Tribe and operates the Absaloka Mine on the southeastern Montana reservation. The vice chairman of the Crow Tribe told Pence his tribe depends on coal. Carlson “Duke” Goes Ahead said this mine provides good paying jobs to about 85 Crow tribal members. 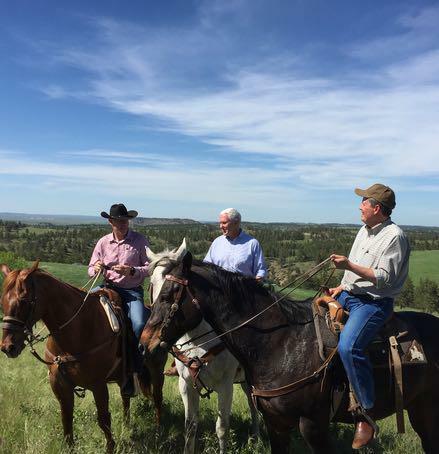 L to R, Vice President Mike Pence and Crow Tribal Vice Chairman Carlson "Duke" Goes Ahead look at a reclaimed area that was once mined. He joined Pence, Daines, company officials, U.S. 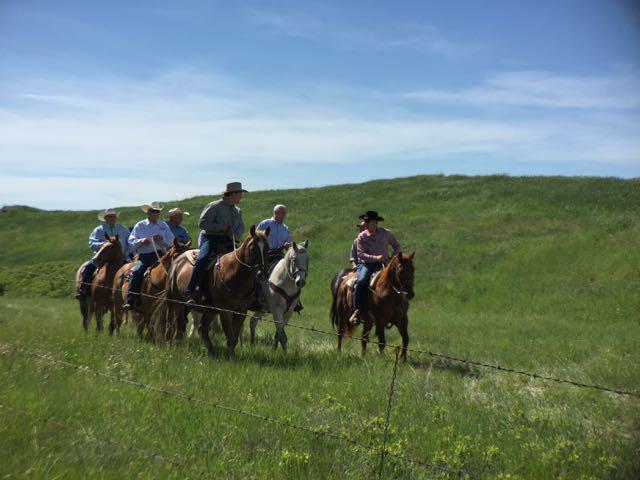 Interior Secretary Ryan Zinke, and others for a short horseback tour to look at an area that was once mined. 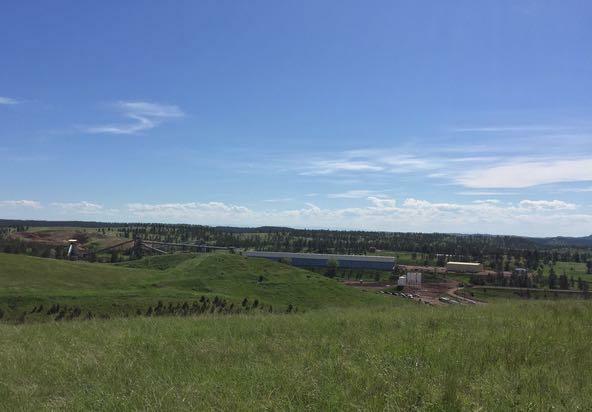 The group stopped on a grassy hill that overlooked a verdant area that is now reclaimed. Goes Ahead said coal is important to more than just the tribe. Goes Ahead said the downturn in the coal market and regulations from the federal Environmental Protection Agency have hurt their economies. Last summer the Crow Legislature agreed to a cut in profits from mining to keep the operation going, but that action resulted in a reduction in funding for the tribal government. Goes Ahead told Pence he hoped the Trump Administration will change a lot of policies. Pence sat down with tribal officials, company representatives and others after the horseback tour at Westmoreland’s mine headquarters. He said the Trump Administration believes American energy drives prosperity and jobs. “And we’re going to continue to work with all of you and with these outstanding leaders who are gathered here to continue to drive the kind of policy to develop a strong energy future in Crow Nation and for all of the United States of America,” said Pence. Pence said President Trump has taken executive action to move the country away from the Obama Administration’s Clean Power Plan, which critics have blamed for further hardships on the industry. Interior Secretary Ryan Zinke, at Trump’s directive, lifted the moratorium on coal leasing on federal lands. “On behalf of the President of the United States I am here to announce the war on coal is over,” said Pence. Coal has been on a downward trajectory for a number of reasons, including market forces which have caused utilities to switch to cheaper natural gas to fuel its power plants. There’s also global competition that’s made it unprofitable to export coal overseas. Coal is taken to this terminal where it is loaded onto rail cars bound for a power generation plan in Becker, Minnesota. During the horseback tour, Goes Ahead wanted the proposed coal export terminals to be built on the Pacific Northwest coast to carry coal to markets in Asia. He also asked Congress to make permanent the Indian Coal Production Tax Credit. After the visit, Pence appeared at a campaign rally for GOP U.S. House candidate Greg Gianforte. Montana is holding a special election May 25, 2017 to fill the vacancy left when former-Congressman Ryan Zinke resigned to become Interior Secretary. Vice President Mike Pence and Interior Secretary Ryan Zinke are scheduled to visit a coal mine on the Crow Reservation Friday. The Trump Administration has voiced its support for the coal industry, but spokesmen for the industry and an environmental organization aren’t certain what can be done to help that ailing energy source.